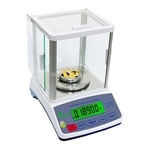 This is our selection of precision lab balances that weigh with 0.01 g readability. These balances offer high precision at a much lower price point than even more precise analytical balances. Perfect for school labs and more. Pan Size: 7.9 x 7.9"